Give web address as "http://repository.maemo.org/extras-testing"
Download rootsh from Application Manager. Install icecast via "apt-get install icecast2"
Search for gstreamer lame plugin: "apt-cache search gstream lame"
"gst-launch pulsesrc ! audioconvert ! lame quality=9 ! shout2send mount=/listen.mp3 port=8000 password=YourPass ip=ServerIP"
You can change the mount, port, password, ip values depending on your setup. The Icecast server is now up and running (assuming there are no errors / typos) and this will stream any audio playing from the device. 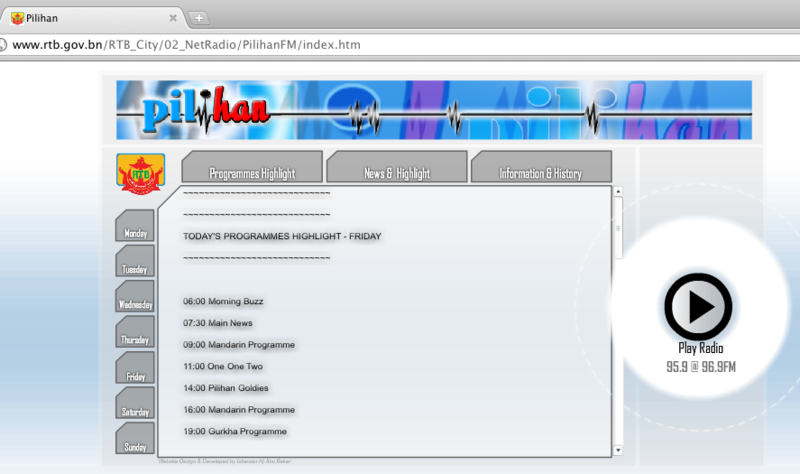 Hearing the calls of people wondering how to listen online to Pilihan FM 95.9, a national news radio station. Previously there was an online streaming feature but it seems to have broke. I managed to track down the website page that I presumed used to stream online but it just gave a Flash player that did nothing after pressing the “Play Radio” button. So being curious as I am, I took a look at the source of the page to see if there was any hints of the URL that they used for streaming. 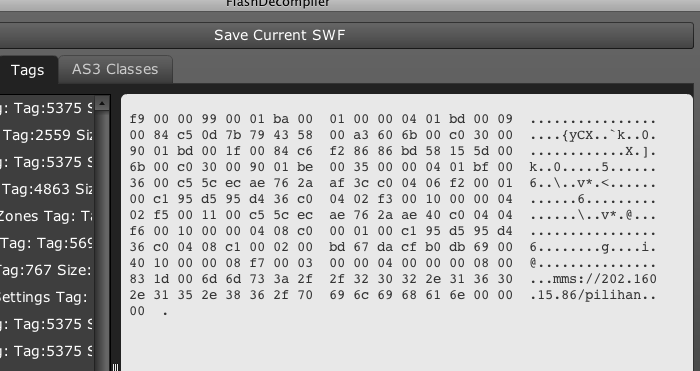 Sadly there was nothing, just the .swf Flash file, meaning that the Flash file itself has the necessary information to start the stream. 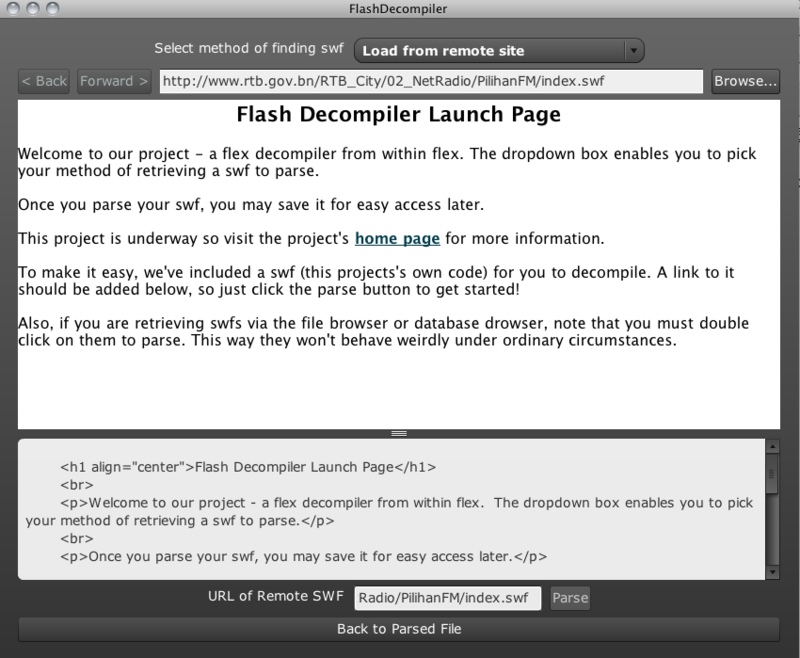 What I needed was a Flash decompiler. A quick Google search and I found flash-decompiler on Google code, which so conveniently is an Adobe Air application and thus is cross platform. Typically tools such as these are built for Linux or Windows, but I’m running OS X so at least I didn’t have to use another computer or boot up a Virtual Machine to use the tool. The decompiler was easy enough to use: just supply the location of the Flash file and click “Parse” and it greeted me with 3 tabs: “Header Section”, “Tags” and “AS3 Classes”. The “Tags” tab seemed to have quite a bit of information so slowly I took a look at it, trying to find what the play button did and if there was any URL that it processed. After a bit of search viola! mms://202.160.15.86/pilihan was found! I tried to load the stream, but there was no response. So it seemed that this was a dead stream that no longer exists or that the streaming device / configuration just died. So this round 1 of exploration is deemed as a failure results-wise as the goal of being able to stream the radio online was not met. So what do you do, when services provided by others don’t work? Well you roll your own solution! In the continuation post we shall learn how to stream audio from a device to the World thanks to the wonders of the Internet. Stay tuned! When I read the story by @ambermac, I tear was brought to my eye by the kind hearts over at Reddit with people wanting to contribute to the cause by getting Ted Williams a phone or clothes and some even gave job offers. From around 320,000 views when I first saw it, it is currently at 4,024,790 views 9 hours later, this is truly a heart warming story of a guy who is down on life and is just trying to get a second chance, and we (the people of the Internet) are sincerely trying to help him out in whatever way we can. For me, today the 5th of January 2011 will be known as Ted Williams day.